Hello! My name is Sarah. I am a wife and mother to two boys, Jack (age 2) and Henry (10 months.) I work full time as an assistant professor at a small university teaching chemistry courses. 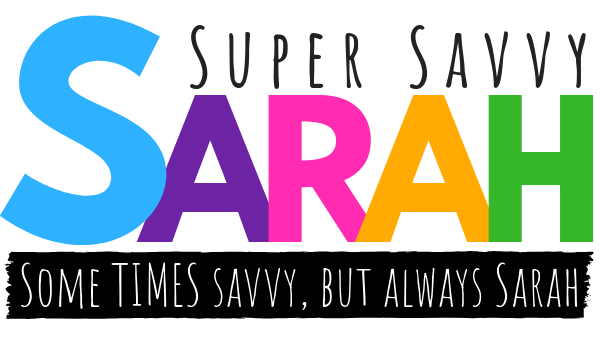 I’ll start by describing myself as a “fly by the seat of your pants, figure it out when you get there” kind of person, which is how I ended up here, creating the “Super Savvy Sarah” blog. I should admit that the story of why I created a blog involves only a little more planning than just a random idea. I commonly find my friends asking me how I get so much done in a day. It still takes me by surprise when I hear this, because my unofficial goal for each day is probably the same as most people’s, to accomplish as much as I can. It pretty much goes without saying that everyday involves at least a little coffee, a prioritized to-do list, and some “mandatory” time to do something for myself. My thought behind starting a blog was to provide a place to direct people when they ask how I get so much done in a day. We’ll return to this question later though because in order to understand why my friends think I “get so much done in a day,” you need to know a little about me and my family. So besides me being a fly by the seat of your pants kind of person, let me tell you a little bit more about me. I was born and raised in rural Nebraska. I went to college 30 minutes away from my parents’ house, and my mom worked on the campus I attended. I always said it was nice because although I was far enough away from my parents to feel like I was on my own, I was close enough that my mom could take my laundry home and return it to me the next day in the trunk of my car. In 2007, after completing my undergraduate studies, I became the black sheep of the family and left Nebraska. I moved to East Lansing, where I began my PhD in organic chemistry at Michigan State. This is where I met my husband, Micah, who was pursuing a master’s degree in chemistry. My husband graduated in 2011 and then moved to St. Louis to enroll in a joint MD/PhD program. I joined him in St. Louis in 2012, after finishing my PhD, and one wedding and two children later, you pretty much know our whole story. Let me tell you a little more about our family. I have an amazing husband, Micah, who is my best friend. I feel lucky, because my husband and I share housekeeping and parenting duties equally. For example, we alternate which parent puts the kids to sleep each night and weekend mornings, one of us watches both kids so the other can sleep in. On the weekends, we typically take the boys somewhere together, like to the zoo or botanical garden. Right now, it is really important that our family spend as much time together as possible, because our time together will be drastically reduced soon. The curve ball is that my husband is on year 6 of a joint MD/PhD program. Currently he is finishing up his PhD, which means that he works a standard 8 hour day. However in the fall, he will start working beyond crazy hours when he returns to medical school and starts his clinical rotations. These crazy hours will last for two years and likely continue through residency. Because of this, over the past couple of years, I have been developing practical routines and methods that will (hopefully) allow our household to run smoothly during this period when I am the main parent to our two little boys and working full time. To add to this, I think it is important to explain that we live more than 8 hours away from either of our families. We do have a group of people who started out as our neighbors and have basically become our family in St. Louis. They are beyond amazing and have been super helpful, but it’s not the same as having family around. So let’s return to that question I posed earlier – how do I get so much done? As mentioned, I’ve developed some routines. For example, I stock my deep freeze every 3 months with mostly homemade freezer meals. Usually people are surprised shocked when I tell them this, they can’t believe I do this and are very curious as to how it works. It’s a process, but I do it because it saves us a lot of time and money AND its makes our live so much easier. Additionally one other priority that I think warrants an explanation is how hard I strive to save our family money. My family currently does not operate on a “strict budget,” we don’t use envelopes of cash or have several bank accounts. We do however try to limit our spending to mainly necessities. For example, almost all of the furniture in our house was inherited from family and we have no burning urge to replace it anytime soon. Also pretty much all our kids’ clothes were gifts or bought second hand and I even cut my husband’s and boys’ hair (which saves us hundred of dollars annually). Additionally I use very practical ways to save our family money, by finding the best prices on things we buy a lot of. I say practical here because I rarely use coupons and I don’t shop all over town for a deal (I used to, but found it’s not worth the time.) I know where the best prices are for the things that I buy a lot of, like diapers and formula. The purpose of this blog is to share with you the practical methods I have developed to help our household run smoothly. I will show you how we accomplish things daily, that in the end save us a significant amount of time and money. I won’t pretend that I live a perfect life; my house isn’t spotless, my office desk isn’t clear, and related to the blog, my photography skills are far from ideal. But I will offer you honesty and transparency, as well as clear step-by-step instructions and suggestions on how to get it all done. I hope that you will subscribe to my blog, to learn practical ways to run your household efficiently, ultimately saving you both time and money. I am very excited to share our family’s journey with you.